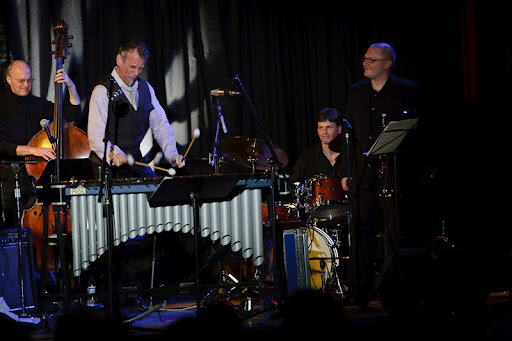 Trumpeter and frequent Joe Locke collaborator Thomas Marriott, drummer John Bishop and bassist Jeff Johnson join the jazz vibraphonist for tonight’s performance. Locke, named the number one vibes player by a DownBeat Critic’s Poll, has over 25 albums as a leader. He’s performed and recorded with Dizzy Gillespie, Ron Carter, Geoffrey Keezer, Kenny Barron, Dianne Reeves, Rod Stewart, and the Beastie Boys. Marriott’s appeared with Locke at jazz festivals and clubs nationally, and the two appear on each other’s albums – Marriott featuring Locke on Individuation, Both Sides of the Fence and Flexicon and Locke featuring Marriott on Force of Four. In 2007, Marriott joined Locke for a performance at the Port Townsend Jazz Festival that won a Golden Ear Award for Northwest Concert of the Year. Locke was born in Palo Alto, California, transplanted to the East, later studying classical percussion and composition at the Eastman School of Music, and is a self-taught improviser. He’s been on the scene for over thirty years and totally smokes the vibes. Go on!